Summary: On page 214, Callie has just gotten to school late after trying, unsuccessfully, to defend her younger brother from a bully. She’s (sort of accidentally) skipped school all week. Placement tests for eighth grade are about to start, and her history teacher is ordering her to get to her homeroom so she won’t be late. Callie is failing history, a fact that she has hidden from her parents, who already have enough to worry about since her father lost his lucrative new job. At that moment, Callie’s new friend Cassius, who is going blind, calls to tell her he’s lost in the subway and needs her to come help him. There’s more, including a grandmother still mourning the loss of her son, who was estranged from his parents after coming out as gay; two wealthy friends who keep asking Callie for the $250 she owes them; and the man in Apartment 1986 of her grandmother’s building, who might be her grandmother’s new boyfriend, and whose apartment seems to be a sort of time machine back to the year 1986. 272 pages; grades 4-7. Pros: The pace is fast and furious, all told in Callie’s funny, honest voice. 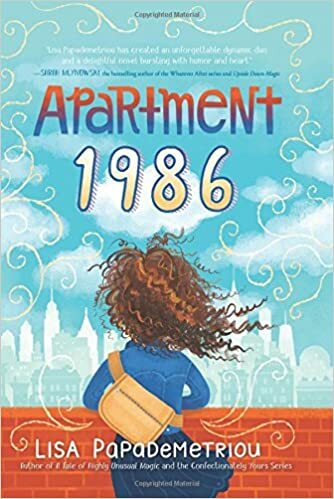 Callie tries to be an optimist, no matter what, but by the end of the story, she’s learned that life is both sunshine and shadows, and the best you can do is try to tell the truth about it and hang on to the people you love. Cons: Be aware, if you’re purchasing this for an elementary library, that the story line with the estranged gay son is a pretty major one. I wish this were not a con, but I speak from experience.